The male yellowhammer is striking in colour having a bright yellow head and chest whilst its back is brown streaked with black and they have a deep chestnut coloured rump. The female yellowhammer is less yellow and more stripy. In flight you can see white outer tail feathers and a long tail forked at the tip. They are slightly larger in size than a sparrow. 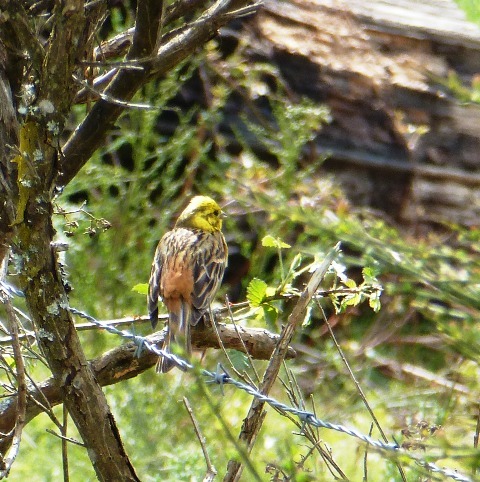 The yellowhammer can be found across most of France with the exception of more southern areas. They prefer to reside in open countryside which is scattered with hedgerows and trees. Yellowhammers feed mostly on seeds but will eat some invertebrates during the summer months. They build their nest close to the ground amidst hedgerows, grasses or shrubs. The female yellowhammer lays on average 3-5 eggs which are glossy white with a few blotches of purple. 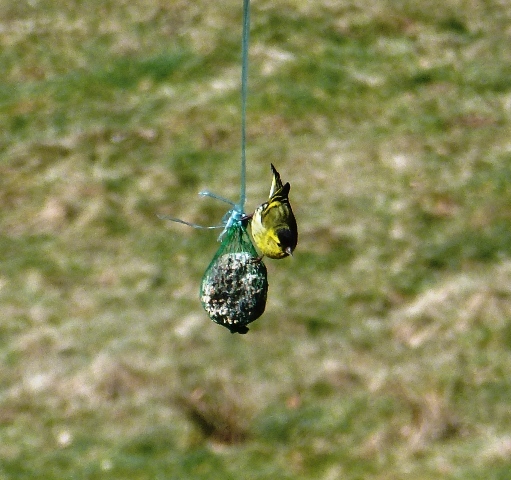 The eggs hatch after 13 days and the young leave the nest about 11 days later. 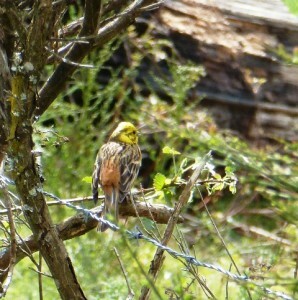 We spotted this yellowhammer whilst out walking today at Bonnefond, close to our home. 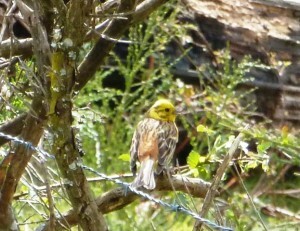 If you’ve seen a yellowhammer near to where you live I’d love to know. great pics……lovely bird…i think i might have heard the call but not really seen them. must look closer the next time i hear the call, it’s quite shreaky ! I love yellow hammers too. They are very easy to identify by sound too. The call sounds like ” a little bit of bread and no cheeese “. Once you think of this phrase when you hear them call you will never forget it! How funny, I’m going to listen out for that now! I am trying to teach myself to listen out for birds as much as watch them. It isn’t easy! Just saw a lovely pair of goldfinches feeding on scabious seeds at the bottom of the garden, which is great to see as apparently goldfish numbers are crashing in France. They are being caught and sold as caged song birds but most die as they are trapped. Another good reason to let wild flowers seed for the birds, as well as flower for the bees. Happy gardening from one Catherine to another! Don’t you just hate auto correct on an iPad? I meant goldfinches – not goldfish!! It has taken me ages to learn some too. Thank you for your post Katherine. i have been searching for a name for this bird for a long time. 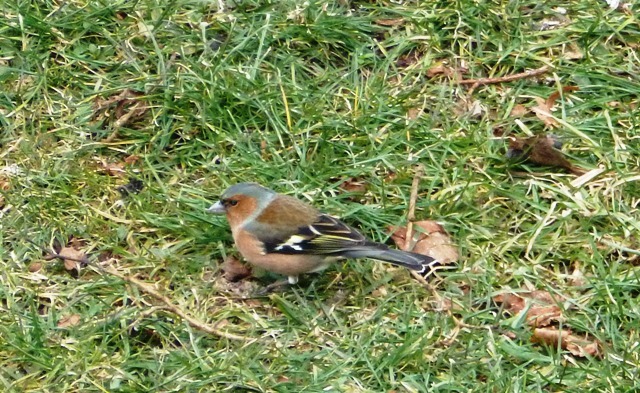 We have at least one pair in our garden, but it is a bird that I see often in small groups. 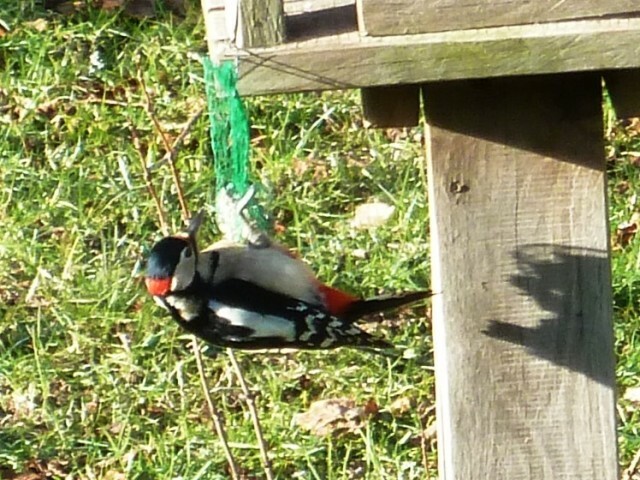 They are often on our kitchen windowsill at our seed feeder. We live in Monflanquin. Lucky you to have them visiting your garden! I’ve not seen any in our garden but we often see them whilst out walking.